In this article we’ll build a simple IFTTT channel to log words used in the headers and bylines of articles we save with Pocket. 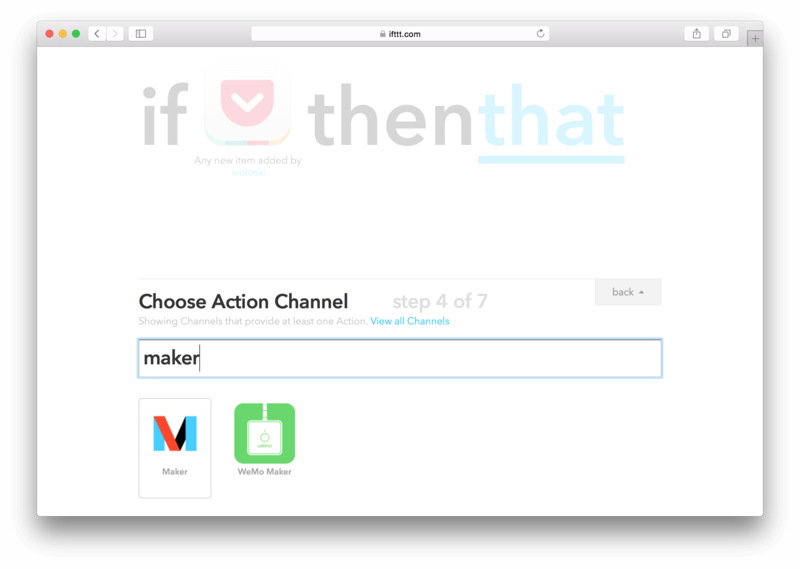 If you’ve ever used IFTTT as a developer and thought something like: “Gee, I wish I could write my own scripts as channels”, you may just be in luck. 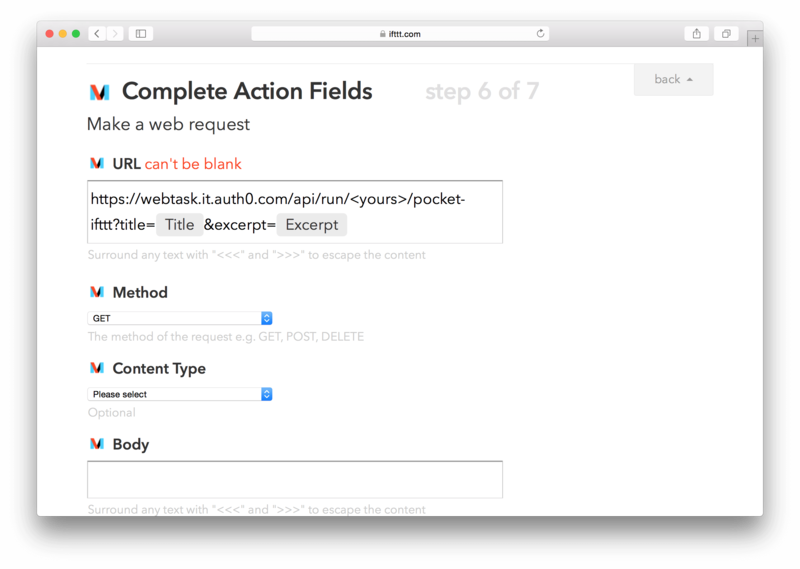 When combined with their new ‘Maker’ Channel, enabling users to call external REST APIs, webtasks can be used to run arbitrary code, on request. In this article we’ll build a simple IFTTT channel to log words used in the headers and bylines of articles we save with Pocket, a ‘read it later service’ which bookmarks interesting articles for later, so they are sortable by frequency. Ease of use. No complicated setup, just code. Vastly simplifies/eliminates the need for backend code, boiling it down into reusable, functional pieces. Tamper proof (uses JSON webtokens behind the scenes), and encrypted where they need to be. You can play with the service and read more about it here, but what it amounts to is a safe and frictionless way to run custom microservices. Perfect for extending IFTTT. The only requirement is that you supply an entry function to be run on webtask.io's servers. And you should be given a URL. Visit it in you’re browser or console of choice and you can see the message is returned. It’s pretty neat, right? Generate a new URL with wt create, but this time when you visit it add &name=<your-name> to the end of the address, and you’re webtask will greet you! Note that you can also add ES6 support to your webtasks easily, just put "use latest"; at the top, and you’re all set! We’re going to take the titles and article excerpts that Pocket gives us and log their frequency. Since webtasks provide no guarantees around data survival, we’ll need somewhere more persistant for the values to live. Here we’ll use Mongo, because it’s easy and free to get access to a database (Mongolab), and pretty terse to code with under Node. We connect to the remote database, put all the words Pocket gives us in an array and loop over it, saving each one, then we confirm to IFTTT that we’re done by responding. Note that we can use require just as in regular Node. There is a list of available modules here, with many of them installed in multiple versions for you to start ``require-ing (require(module@0.13.2)`). And SECRET will by passed on ctx.data, just like the variables attached on the querystring. If you haven’t already set one up, sign up for a sandbox account at Mongolab and pass in your database’s address as a the secret MONGO_URL=mongodb://<your-database>. 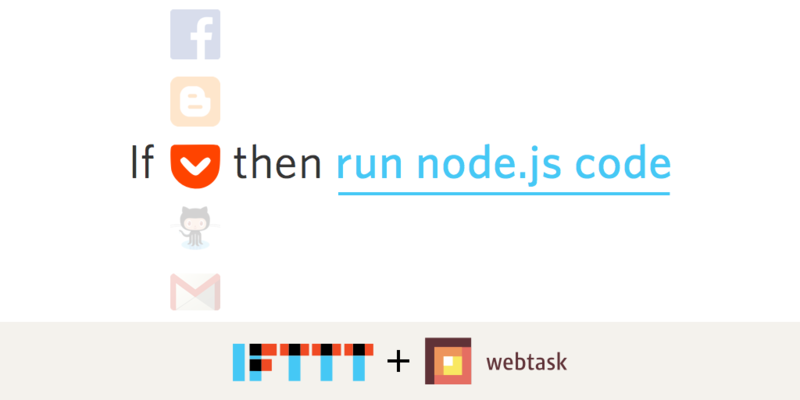 Connecting your webtask to IFTTT is relatively painless, just setup a recipe to be triggered every time you save something to Pocket. And configure the ‘That’ component to be a ‘Maker Channel’, where we can hand over control to our script. Copy and paste the URL given by wt create into the box, but add &title=&excerpt= to the very end. This dumps the data given by the Pocket channel, making it consumable in the webtask’s context. Sometimes it takes a little while for IFTTT to send the request (within a couple of minutes), but you should see a bunch of ‘Successfully saved’ messages in your console. We can soup it up by ignoring common words and punctuation, saving extra data etc, but the use of webtasks would remain the same. The finished recipe can be found here, and the source is on github, for your viewing pleasure. If you’d like to find out more about how webtasks work, as well as their more advanced features, you should check out the docs at webtask.io, but hopefully you can see that their simplicity and versatility is already pretty exciting! © 2013-2018 Auth0 Inc. All Rights Reserved.